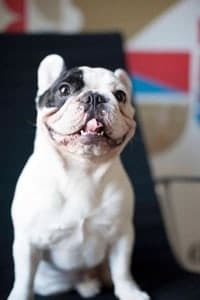 Manny is a 4 year old French Bulldog from Chicago who rose to fame on Instagram and is now one of the world’s most followed French Bulldog on the Internet! With a unique fondness for sleeping in the bathroom sink and his “Frenchie talk”, he has built a celebrity fan base and a network that reaches over one million people and growing! He is quite the philanthropist and is always finding creative ways to give back to both human and animal charities alike. We were so excited to have the chance to sit and speak with Manny the Frenchie as he told us all about his awesome life! And we’d like to give a special shout out to Audrey for submitting question #7 – she is a HUGE fan of yours and was so excited to be a part of this interview. Thanks Audrey! 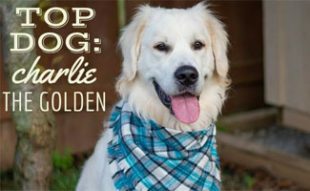 We hope you enjoy this exclusive Top Dog interview with Canine Journal and tune in each month to meet a wide variety of canine characters. 1. How old are you and how did you get started on your track to fame? I just turned 4 dog years in February. My humans were obsessed with taking my picture, understandable since I am pretty hilarious. So, they decided to start my own Instagram page. Since my paws are too chubby to type, my humans are nice enough to post for me. After approximately one year of posting funny pictures of my sink naps and videos of my “Frenchie talk”, we noticed a huge increase in followers (increasing daily!) and it just continues to sky rocket. 2. How did you find your forever home? Before I came along, my parents had my big brother Roscoe and sister Leila. When they decided they wanted another dog, they researched what breed would fit with the family. They instantly fell in love with the French Bulldog. They started their quest on finding a puppy Frenchie to rescue, but had no luck. Finally my Dad found a breeder that had one last pup from her recent litter that no one seemed to want. That puppy was me! I was almost 5 months old and the breeder was going to give me away to a shelter because she could not seem to find me a home. I was just waiting for the right family and I found them! 3.What is your favorite treat? I love anything meaty! My humans trick me into eating fruits and vegetables sometimes by calling it “bacon”, but after a quick sniff they can’t fool me! 4. What are you most proud of in your life so far? I love being able to help other pups and people in need. It’s something me and my humans are so proud of and can only hope to be able to continue our fight for everyone who needs it. 5. What’s your greatest talent? 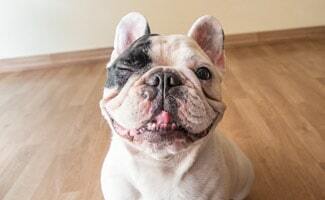 I’m pretty much the only Frenchie that I know of that can “speak” on command. I was just born with this loud, shrill talent that my humans love oh so much! 6.What are some of your favorite past times? I love to sleep and cuddle my humans. I also love to chase my brothers and sneak their treats if they’re not quick enough. I love to go on car rides and get quite upset when I don’t get to come with. 7. 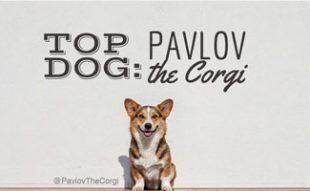 Do you play with any other top dogs and what’s your favorite game? My brother Frank is getting to be pretty popular. As well as my little brothers, Filip and Liam. We love to chase balls around the house and wrestle. I’m also going on a US Charity Tour of different cities and I’m having local top dogs in each city help me co-host my events. It’s going to be a blast! 8. 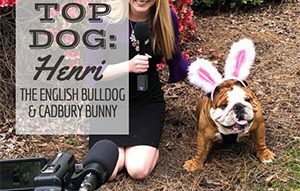 What would you tell other dogs who want to get into show biz? It’s not for everyone. I’m very comfortable around humans and big crowds but some dogs simply aren’t. My humans always keep my safety first and make sure I’m never stressed. Don’t force your pet into anything they can’t handle and keep it fun! Great tips and stories, Manny! 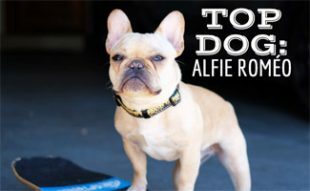 So now that you’ve gotten to know this famous French Bulldog a little better, there’s no doubt that you want to follow him on all his adventures. His most popular channel is Instagram but you can also pick your favorite way to stay in touch on his website.